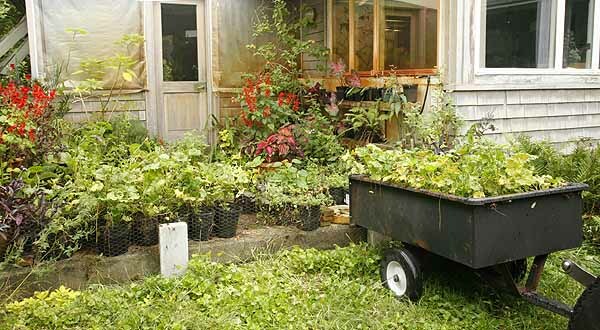 Day to day life living and working on a medicinal herb farm..
How to transform your seedlings into great plants. Once your seedlings have grown to a good size in their seeding trays then its time to transplant them into larger pots so they can grow to a large size before planting them out in the great wide world. 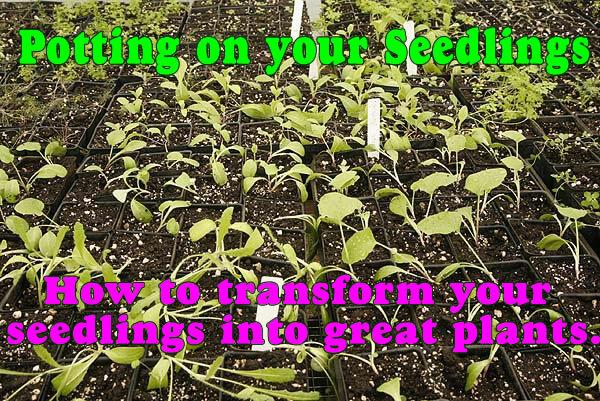 Starting seeds in either plug or seed trays allows seeds to be intensely cared for while they are starting their life. Once they start to grow strongly then they need to be moved to larger pots to allow them to keep growing to a larger size before being moved outside. Can’t I plant directly outside from a plug tray? That is going to depend on how large the plugs in your tray are. 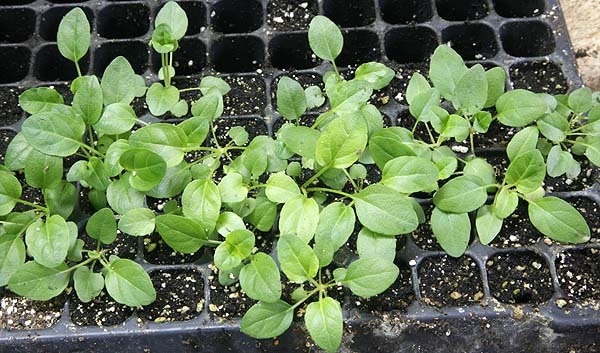 If the cells are 1 ½ – 2” (3.8 – 5 cm) across with individual plants in them then most likely you can. If the cells are smaller the plants usually cannot reach a large enough size to be planted outside with certainly that they will survive. This is especially true now that temperatures are fluctuating so much due to global warming. In past times temperatures in spring did not reach the 90’s as they do now. Little plants cannot survive well in such temperatures and tend to fry very quickly. If you are going to make all the effort to grow your plants from seeds its all wasted if they are put in the ground too small and die. First thing to do is to secure a supply of reasonable sized pots. Here we use 2 ½” (6.35 cm)square pots. The reason for this is that square pots are easier to stack in a seed tray and deal with little or no wasted space. We have found this size pot is ideal for all our potting on needs and 32 fit exactly into a outer seed tray or carrier tray. You can choose whatever size or shape pots that you prefer but using square ones to minimize space is always a good consideration. We use all plastic pots these can then be washed and sanitized with bleach so they can be used time and again for many years. This is the most economic way to pot plants on. Potting mixes can be purchased in bags from most garden centers or big box stores. See How To Choose A Potting Or Seeding Mix for details on choosing a mix. If you need quite a lot of potting mix and have company near you that supplies plants to garden centers you can always call and ask if they sell their potting mix. Most of these companies create their own mixes for their use and will often sell bags of it to the public. IN most cases you do need to buy several bags at once or they may have a minimum value order. Don’t call and ask if you only want one bag, you will need to be considering at least 5 or more bags before they will even consider you. If you need quite a lot of potting mix you can create your own if you choose. If doing this you will need a supply of ‘base mix’ that is the main ingredient to the potting mix. In some cases this will be sphagnum moss or coconut core but you can also use well rotted and seasoned compost that has been well screened and was created at high enough temperatures to kill all the weed seeds. There may be many other local sources that you can use. Here at Floral Encounters we use mushroom compost. Simply because it is cheap and readily available. This will not be the case in most parts of the country but we live near the major mushroom growing areas and they have tons of spent compost moving through their houses daily. We buy well rotted (for one year after leaving the compost house) screened organic Ph balance compost by the truckload. We then use it on our fields and for making our own potting mixes. Whatever you choose ensure that this material is MOIST before creating your mix. Not wet but just moist all the way through so when you grab a handful it feels slightly moist but not wet. The material you choose should separate easily and be slightly fluffy to the touch. DO NOT use soil from your garden. This is always going to be too heavy and it will contain lots of weed seeds and other material that could be detrimental to the growing of your small plants. This may seem strange since you are going to put the plants in the soil later but soil outside in the ground behaves very differently to soil in pots in a tended location such as indoors, in a porch or on a windowsill. Outside is a whole different ecosystem but in a tended location pathogens, weeds or pests dormant in the soil can become active and kill off you seedlings very fast, so always use a sterile mix not garden soil to pot plants on. Once you have chosen your base and ensured that it is all moist then its time to mix in the other ingredients. For more detailed information on these ingredients please see How To Choose A Potting Or Seeding Mix. 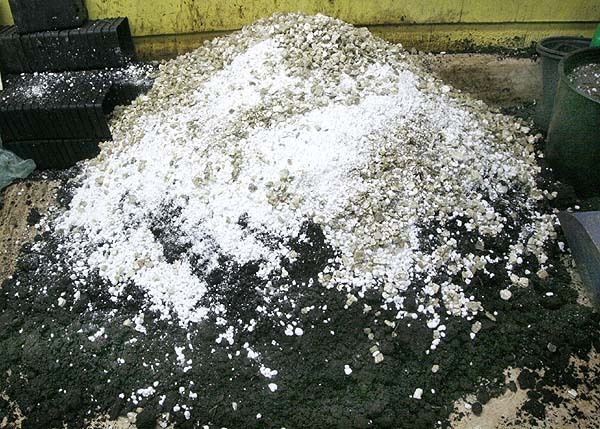 The best results usually have about 15% of each perlite and vermiculite in a mix. These ingredients can be purchased in small bags from most garden centers or big box stores. If however you intend to use a lot of the material you may want to see if you can find a commercial source. Most greenhouse supply companies sell this material in large bags. Check your area to see if you can find one then call and ask if they will sell to the public. Many will not sell to you unless you have a business license. Bear in mind however that any business license will usually suffice it does not have to be horticulture. 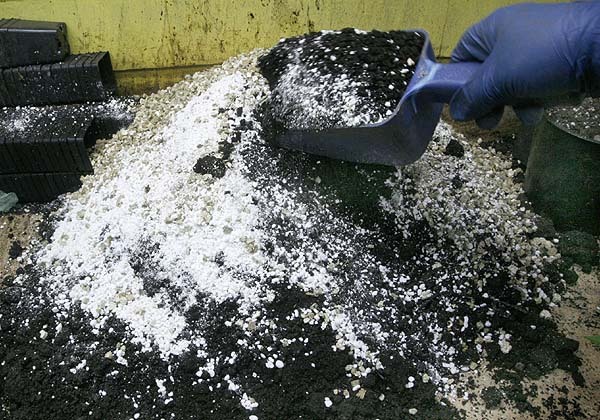 USE A MASK WHEN WORKING WITH PERLITE AND VERMICULITE. Never work with these materials without using a face mask. 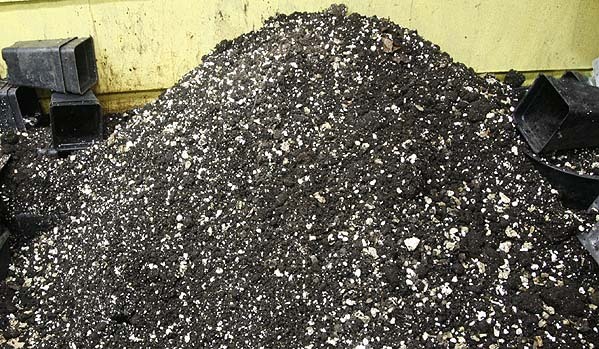 Perlite especially is extremely dusty and will not to your lungs any good at all. Put on a face mask before opening the bag and moving the material. Use a plastic scoop to move material from the bag to your potting mix once the material has been added than you can mix it all together. Take a look at the result and adjust the amount of any of the ingredients until you have something that looks right. Time and experience is the best for this using your own chosen materials. Small batches can be mixed on a potting table larger batches can be made directly in a wheelbarrow. Once the mix is finished the pots can be filled. Scoop the moist material into each pot and stack in the tray. When all the potting mix has been used or enough pots have been filled then water all the pots. If you have a stack of trays like we do then move all the trays around so you can water each one well then restack them ready for planting. Its important to ensure that the potting mix is well moistened before you begin potting. Using the ‘shower’ setting on your hose pipe is the ideal way to do this. Make sure you don’t spray water all over your potting area in the process as potting mix tend to cling to everything and you will trample it everywhere. 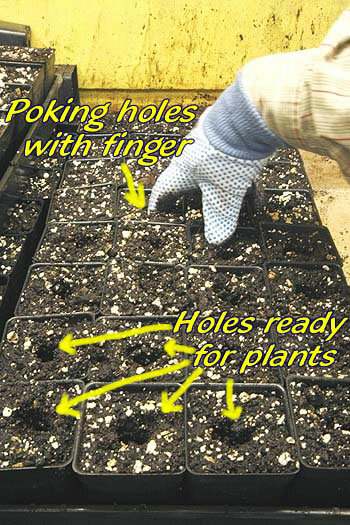 Seedlings need a hole to be planted into if they are a plug or bare rooted they will still need a hole. The best way to do this is with your gloved finger. (Its going to get really messy if you are not wearing gloves while potting). Stick your finger into the center of each pot to make a hole in the mix. If the hole does not stay there when you pull your finger out but crumbles and falls in then your mix is not moist enough. If it goes ‘squelch’ then its too wet and you need to let it dry out a bit before planting. Check on the root ball of your little seedlings. If they roots are starting to show out of the bottom of the plug trays then it is the ideal time to repot. The best time is when the roots have filled the cell so that they hold the soil together while being moved to their new home. This ensures the minimum disturbance to the roots. IF the roots are still small and the soil falls away from them then they are more prone to failure on repotting. If the roots are so large that they have created a mass of roots below the seeding tray then roots will be damaged on repotting and plants will have a harder time. They may recover but it will take longer for their roots to regrow before they can start creating more leaves and getting larger. This is going to depend on how your seedlings were planted. Assuming you have one plug per tray its going to depend on the size of the tray as to which tool you use to remove the plug from the tray. We use a variety of tools. For our larger plugs we use a stainless steel ‘mini gardening tool’ that are actually sold for indoor gardening but work wonderfully for this task. The long pointed ‘shovel’ of other mini tools works just as well. For small plug trays it’s a matter of pushing the plug out the bottom of the tray. For this we use a plastic rod. This one I got recycled from a pair of shoes that came with ‘shoe holders’. Usually its trash to be thrown away but farmers are the ultimate in recycling. 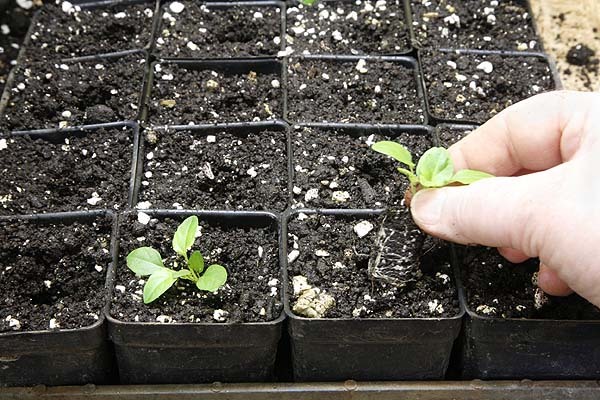 Whatever tool you use to remove your little seedling from its original home make sure that the roots come up cleanly in one lump of soil try for as little root disturbance as possible when repotting. Sometimes the soil will fall away from the roots in these cases make sure that the roots are neatly tucked into the hole you created for the plant and gently pull the soil in around the little plant. 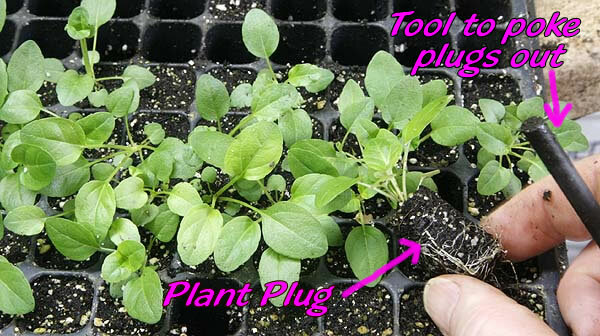 With plug trays there is usually no reason at all to grab the plant when repotting all the work should be done with the root ball this reduces the stress on the plant. In seeding flats is more difficult to move plants without disturbing the roots. Plants need to be ‘dug out’ of the seed tray. Again the best tools are the mini gardening tools sold for indoor gardening. The shovels are ideal for this task. If you don’t have one try a very small teaspoon. (no all teaspoons are not the same size). Carefully remove each plant ensuring you get all the roots. IF plants have grown together carefully and cautiously separate the roots from one another trying not to break any roots. Transplant to new pots. You may need larger holes and more time and care placing each plant to ensure that all the roots are carefully in the pot and covered well with soil. IF there are any plants that are much smaller than the rest but have had their roots disturbed by moving the larger ones you have the choice of leaving them in the seeding tray or transplanting them at the same time. It is often better to transplant unless they are very small as this means the roots will only be disturbed once rather than twice. If the smaller plants roots are nowhere near the plants you dug up then leave them to get bigger before transplant. When moving seedlings from general flats and sometimes with plug trays you have to get hold of the seedling. Some seedlings are very small and fragile so great care must be taken. The main rule is. NEVER GRAB THE SEEDLING BY THE STEM. You get that stem broken and it’s the end of the plant. It cannot regrow a central stem it’s the only one it has. ALWAYS hold a seedling by one of the leaves. I know that is not always that easy, but it can regrow a leaf it cannot grow another stem. For seeds with fragile stems like balsam, impatiens, peppers and such like be very careful as the stems snap very easily. Some plants have much more wiry stems and are easier to handle, but often they don’t like it and if you grab the stem the plant may not survive anyway so take care. Another way to handle seedlings is using broad plastic tweezers to hold the plant leaves while transplanting. This ensures that you have a good grip on the plant without causing it too much harm. Fingers can be a little large and clumsy when dealing with little seeds but plastic tweezers can work very well. Make sure they have a broad end not a point. Metal tweezers are usually too harsh. We used this method a lot before we changed to using plug trays. While many sources say that you cant grow plants with tap roots in pots to begin with, its not true. It just means that you need to be very careful not to disturb the roots when transplanting. There are several important factors here. 1. Know that the plant you are dealing with has a tap root. Its surprising how often people just treat all the plants the same and then wonder why the ones with tap roots did not survive. 2. Always make sure that the plants are transplanted without disturbing the root ball. That means, DON’T grow them in open flats use plug trays or individual pots. When transplanting plugs make sure they are moved before the roots come out the bottom more than just a little showing. Transplant the whole ball without disturbance. 3. When planting out use the same methods as for plugs. Keep an eye on the pots and move them out as soon as the roots start to show out the bottom. Once the plants are in their new pots. The first thing to do is water them. Now using the misting nozzle on you hose or the misting bottle you have been using. Make sure there are well saturated. Move the trays to a good location. In many cases the pots can go back into the same area that you had the seed trays. However they are now going to take up a LOT more space than they did before so plan accordingly. In most cases the weather outside is not yet suitable to put the pots out so find a good location inside or in a very sheltered area out of the sun. Although daytime temperatures may be good enough often the temperature drops too low at night. So if putting plants outside keep a good eye on the overnight lows and move the plants inside if they get below the high 40’s. Inside a window in full sun is acceptable or under grow lights. Find your own best space. 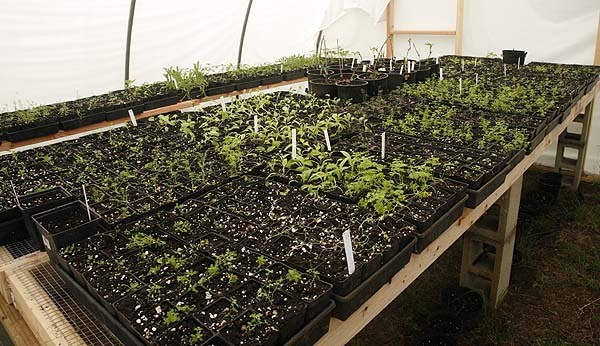 We used to use a large window in full sun to grow our seedlings and our potted on plant them move them to a cool greenhouse as they acclimatized. Now we have a new potting greenhouse with white plastic to ensure that they plants to not fry in the hot sun. Do not place any newly potted on plants outside in full sunshine. They will need time to acclimatize to their new home and get their roots established. Once they are reestablished and the temperatures rise sufficiently put the plants outside in a shaded location off the ground. A shaded bench or table that does not get sunshine during the day is best. As the seedlings grow they can be moved to dappled shade then full sunshine. Never move any plant from the shade to direct sunshine all at once it will burn just like you would. Take it gradually. Once the plants have hardened off and are used to the sunshine they can be moved out to their final position in the garden. More on that in a later article. Author Janice Hazeldine PhDPosted on May 25, 2017 May 25, 2017 Categories Garden work, plants, things to doTags care of seedlings, how to transplant, how to transplant seedlings, next step from seeding plants, potting on seedlings, potting seedlings, transplanting, transplanting seedlingsLeave a comment on Potting On Your Seedlings. This year we have to be ahead of he cleanup game. It’s been leaking for a while now, but only a little bit. At first it leaked only a very small amount when the wind was from the south and a certain angle. We got a few drips once a year perhaps. We could live with that, we had to there was no money to fix the roof. Then Hurricane Sandy came along and really shook things up a lot. During Sandy it managed to find its way down between the wall and produced a nice bulge on one of the walls which later of course all the plaster fell off of. Then fortunately it stopped again at least for a while. 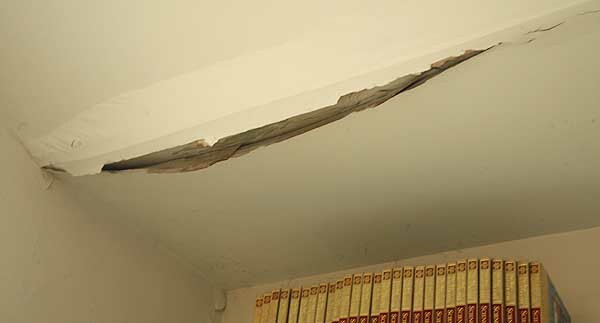 Then last winter it began to leak more and drips were coming down from the ceiling, creating a nasty pealing patch. Not satisfied with that it decided to move the location of the drips around a bit, just to keep us on our toes I suppose. This meant that instead of having one drip tray in the room we had to have several located over several spots in one room. This room is of course the one we had chosen to keep all our books in. So we had to put plastic on top of the bookcases and drip trays along the top as well. Then it moved again and sneaked down the wall in the laundry room (only called that because the washing machine is in there, its more of a mud room come everything room really). We agreed the time had come, we had to get the roof fixed. We got some quotes and decided on a roofer but got held up looking for someone to dismount our solar panels so we could have the roof redone. That was a bust. They wanted more to get the panels off and on again than it would cost for the roof! What a crock! Fortunately that portion of the roof is not leaking and is well protected by the solar panels so after calling around quite a few places and getting ridiculous quotes we have decided to go ahead and get the rest of the roof done, leave that portion and work on the panels ourselves later. Then get that portion done. The roofer has no problem with this either. It will cost a bit more but we cant wait around any longer and we don’t have time to do it ourselves this year. So we signed the contracts, in celebration the heavens have opened and its been raining for two days, we have trays everywhere in the ‘library’ catching water. Our main problem now is that we have to remove everything from around the house so that they can get to it. I use our patios especially the front one as nurseries for the plants that are not ready to go in the ground yet, or don’t have any space yet. We have a lot of plants crammed on our front patio. 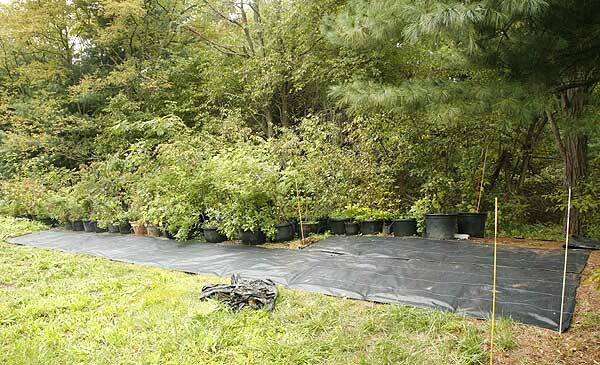 We are intended to move them to a temporary hoop house that we will be erecting to protect our larger pots of trees and shrubs, just make it a little bigger and put them in their too. However we had planned to have more time to do this. The roofers are coming in two weeks so we have to get the plants moved NOW. Potted plants being moved from our patio nursery to winter protection area. So before the big rain started we were out laying ground cover fabric where the hoop house is to go and moving some of the plants off the patio to the new area. I loaded up the small cart and we managed to get all the smaller plant pots moved over before the really heavy rain started. We got wet but not too badly. Unfortunately there are still a lot of plants that are in pots that are too small to overwinter. So a mammoth repotting session was in order. 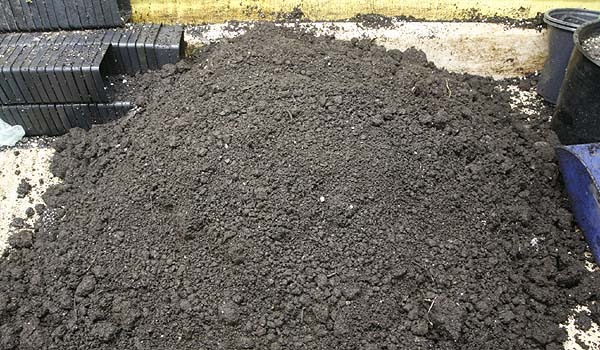 We make up our own potting mixture using mushroom compost as our main base (because its cheap here) adding other elements like pearlite and vermiculite and other thing to get it more aerated and more attractive as yummy plant food. So Steve trekked in compost and made up the mix and I repotted. For six hours straight. Laying ground cover to hold plants from patio in wintering area. I actually like repotting and I love to do it when its raining. I work in our small ‘greenhouse’ not a real greenhouse yet (its on the wish list) but a screened in porch with plastic on the windows. There is a lot of ventilation available and its you can hear the rain pattering down creating a very pleasant atmosphere to work in. Of course every now and again you get wet dashing outside to either put plants on the patio or collect trays for repotting but it’s a small price to pay. I finally finished around 7.30pm. All the small plants are now in larger pots and waiting transportation to the hoop house area. Then we just have to move all the other pots off the patio and into the greenhouse for the winter. We don’t usually do this until the end of October when the temperatures fall to freezing but this year with the roofers coming we have to be ahead of the game. Author Janice Hazeldine PhDPosted on October 11, 2016 October 12, 2016 Categories Farm work thru the yearTags fall cleanup, fall farm work, farm work, potted plants, preventing frost damage, transplanting, winterizingLeave a comment on The roof is leaking! 350 plants transplanted to the field today! It took nearly seven hours, but with cloudy skies and cooler temperatures it was a perfect day to transplant many of our little plants to their field locations. Transplanting on a cloudy day is essential. When little plants are placed in a new setting they are stressed – just like people – setting them out under bright hot sunshine can be too much for many plants and they fry. Picking a cooler cloudy day to do this work gives them more time to acclimatized to their new environment and get their roots moving to pick up moisture. Its even better if the cloudy day is going to be followed by rain, steady solid rain is better than abrupt storms but rain of any kind is good. During the spring months I watch for these days and get outside as soon as possible to hand transplant as many plants to the field as possible. Friday was just such a day, well almost it poured with rain first thing so I was held up a bit before starting. We grow all our plants in 2” square pots, when they are large enough to survive in the fields they get moved out from our patio area. A hole is punched in the white plastic mulch and the plant is knocked out of the pot and placed in the ground. Once the row is completed the irrigation is run to allow them enough water to set their roots in well. 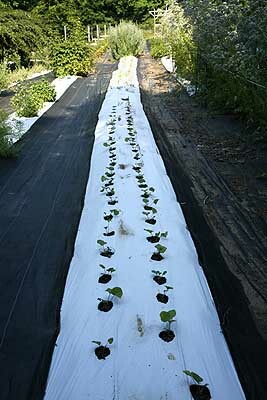 If the irrigation for a particular row is not yet set up they are watered by hand. Each plant hole is punched by hand and each plant is transplanted by hand, the empty pots are then collected up and returned to the greenhouse for washing and sterilizing ready for next years plants. 350 plants is 350 holes and 350 transplants, it’s a lot of work. Still we now have a portion of our crops in the field where they are easier to take care of. The others are still growing to a large enough size and waiting for the next cloudy day to be transplanted to their new homes. Author Janice Hazeldine PhDPosted on June 3, 2016 June 20, 2016 Categories Farm work thru the yearTags moving plants to field, planting plants, spring field work, transplantingLeave a comment on 350 plants transplanted to the field today! NOVIAN on Labor Day Is When You Labor On Your Lawn. NOVIAN on 14 Reasons CALENDULA should be part of your summer garden. The Wayward Frog on Beating The Heat On A Small Farm.